"The heart has its special places; quiet retreats, fragrant with the sweet perfume of flowers, bathed in the romantic light of sunset, soothed by the music of a laughing brook and droning bees. Places made possible by the precious gift of love. I compose my quatrain to remind myself that two people who care for each other can create a very private world, colored by shared memory. Truly a place in the heart. The thought delights me. It has inspired me to create a three-piece print collection celebrating the creative power of love. Each painting illuminates a line in the poem "A Quiet Evening," "A Peaceful Time," "A Life Worth Living." We begin with the passionate fire of sunset, the graceful shelter of a magnificent weeping willow beside a quaint stone cottage, the Edenic tranquility of a pristine stream flowing through a lavish flower garden. Here is A Quiet Evening born in the hearts of lovers." 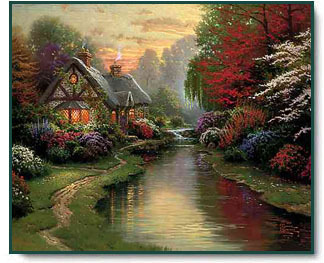 A Quiet Evening copyright© 1998 by Thomas Kinkade.